Miniature, low maintenance, easy care—what more could you ask for? Jade plants are popular because they require minimal watering and just the right amount of sunlight. But what does 'minimal' mean? How often do you actually need to water a jade plant? 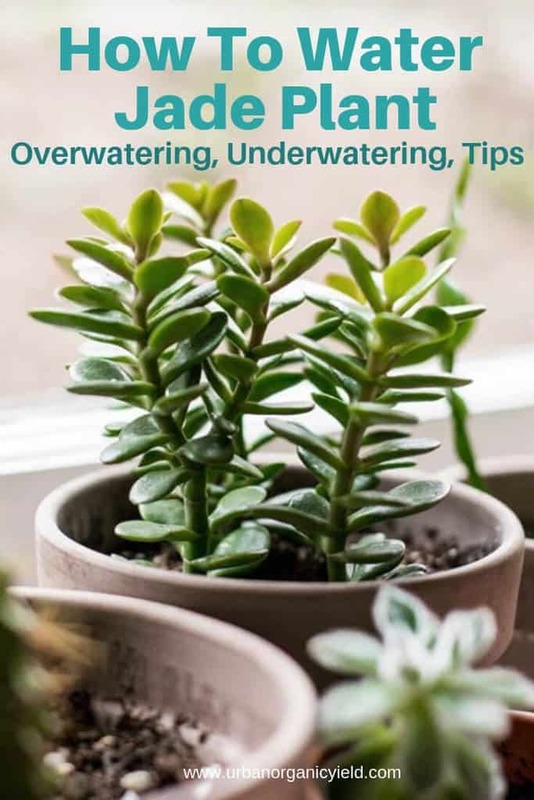 Are you puzzled about whether your jade plant is drowning or begging you for water? You're reading the right article! In this page, I will explain how often your jade plant needs to be watered. I've also compiled other essential aspects you will encounter in watering a jade plant. With the right instructions and methods and a little bit of experimenting, you can even pass down your jade plant for generations to come. But first, you must understand the plant and its common issues. Let's start! First things first, let me introduce you to what’s known as the money or lucky plant. The jade plant is also a succulent known for its longevity. Its vibrant green leaves are considered symbols of growth, renewal, wealth, and prosperity. A jade plant is an example of a succulent houseplant that is easy to grow. Given its nature, jade plants are resilient and may be grown as a landscape plant. Jade plants can grow into jade trees and live for up to five to seven decades when properly maintained. Crassula Ovata is a compact and rounded plant with glossy, elliptic-shaped leaves. It has brown, thick, and woody stems. Some jade plants may develop a thick, scaly trunk, which gives them a tree-like appearance. Here’s the catch, jade plants do not like to be overwatered. Besides, overwatering can lead to a high chance of rotting at the base. Jade plants can thrive even without much water. On the other hand, underwatering may cause succulents to drop leaves or get leaf spots. Too little water may lead to the plant’s roots to dry out. Keep in mind that the roots will get the water and nutrients from the soil. The soil needs to be soaked with water, but it must immediately be drained as well. Fungus gnats or benign mushrooms grow when the soil has too much moisture. Another thing you should watch out for is bugs on the stems and leaf joints. Mealybugs and spider mites can also cause black spots or even eat away the jade. Putting alcohol on a cotton ball or swab can exterminate the pests. How Often Should I Water My Jade Plant? You’ve probably experienced how watering could sometimes be frustrating, right? Picture this-- people drink water whenever they feel that their throats and mouths are dry, especially in warmer environments. The same goes for succulents. As a rule of thumb, water your jade plant at least every seven to 14 days. Your jade plant will need more water during the growing seasons of spring and summer. In contrast, jade plants need hardly any water during the cool winter months. Yet, they still need water at least once a month to keep the leaves from shriveling. You must not let a jade plant dry out completely.However, do not water a jade plant too often, as this can cause root rot. The key is to encourage the roots to grow downward for water, not towards the surface. Do not water your jade plant when the soil is still wet. Furthermore, only soak the soil if the pot has good drainage to ensure that the pot won’t sit in water. If you are using a drip tray or cache pot, make sure to dry it out too. Outdoor plants are likely to be watered more often because the airflow outside helps evaporate water faster. Succulents planted in the ground don’t have to be watered quite as often as succulents in pots, because the soil stays cooler and doesn’t dry out quickly. Creating a schedule of when you will water your plant can make things complicated. In fact, it can either lead to overwatering or underwatering. Rather, you can know whether your jade plant needs water by checking if the top of the soil is dry. Similarly, you can stick your finger an inch into the soil or as far as you can (you may also use an actual stick) to feel any moisture. A soil moisture gauge can also help you monitor the moisture level. In general, succulents survive in completely dry soil for five to seven days, especially if they have well-established roots. As your jade plant grows and starts to have more well-established roots, you can gradually cut back on watering. 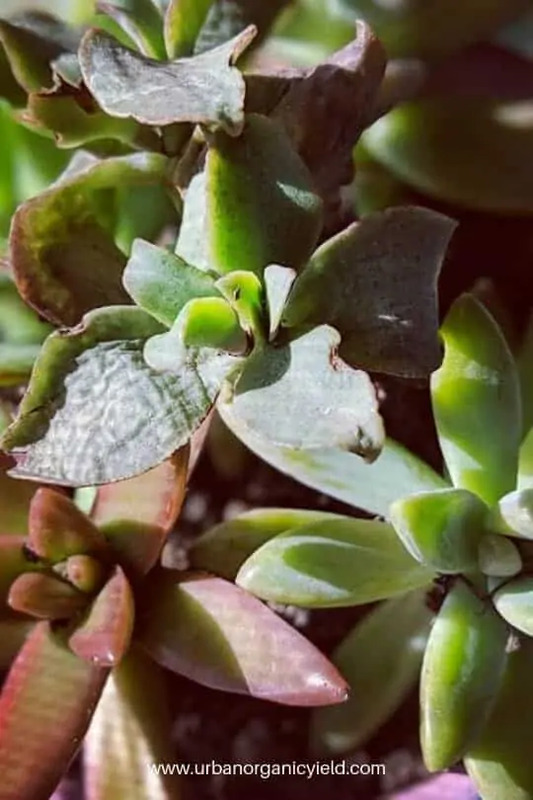 I have found that the frequency of watering isn’t the only factor you should consider.In the next parts of this post, I will explain why other matters such as sunlight, temperature, soil, choice of pots, and location can dictate how often your jade plant needs water. What Can I Use To Water My Jade Plant? A small watering can with a long sprout can do the trick. How to Save Overwatered Jade Plants? Too much water tends to kill succulents faster than too little. Overwatering can cause the stems to rot and be mushy. Consequently, a mushy stem can cause the leaves to rot and fall off. Remove the saturated soil from the roots and fill the pot with fresh soil. Use a clay pot with good drainage holes to help the soil dry. If it's still not working, you can cut off the stem a few inches above the rot and then propagate the jade plant. Free the drainage holes from any debris. trim your leggy jade plant? The appearance of your jade plant’s leaves is also a good determiner of when you must water it. Leaves can store heaps of water, but will flatten out and get a little less hard as the plant uses the water. Well-watered leaves look plump and convex on both sides. Avoid splashing water to the leaves, because this may cause rotting. The leaves of unstressed succulents are green, while stressed leaves are vibrant or muted colors. Don’t fret when you see the tips of your leaves turning a shade of red.It means you’re doing a good job in making the plant happy and exposing it to a lot of sunlight. Translucent yellow or brown-colored leaves are also signs of overwatering. Finally, it’s likely that your jade is rotting when its leaves are turning black and falling off. How Much Sunlight Does My Jade Plant Need? Can your jade plant survive direct sunlight? Of course! If you want your plant to grow strong and thick, expose it to a lot of light for at least four hours a day. I recommend placing your jade plant next to south-facing windows so it can receive plenty of daylight without being exposed to excessive amounts of sunlight. If your jade plant still lacks sun exposure, you may consider using a grow light. You might be wondering why your jade plant is becoming taller. The amount of sunlight your jade plant receives is a critical aspect of its survival. As a result, jade plants tend to stretch out when it's not getting enough light. Be careful though since the leaves and stems are full of water.Jade plants are sensitive to sunburn, which can cause leaves to turn brown.Hence, severe sunburn may be fatal to jade plants. 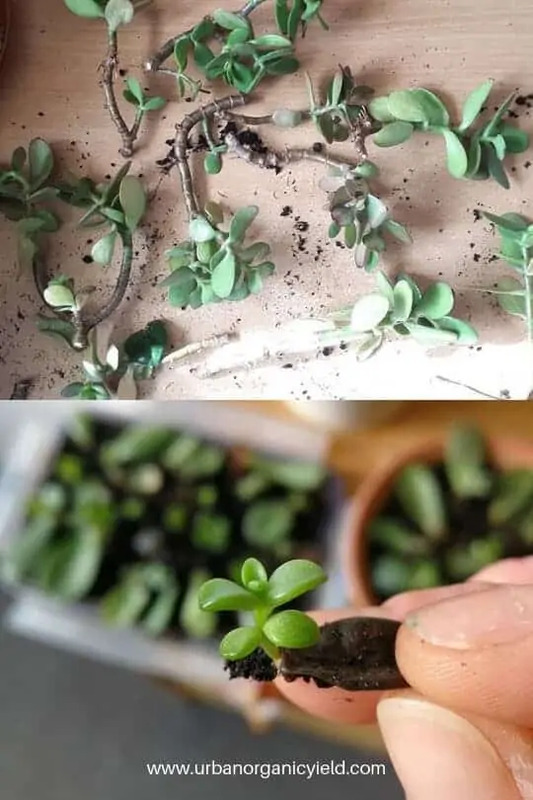 Propagating is another way of both saving and growing a jade plant. Jade plants can easily be propagated from stem or leaf cuttings in slightly moist, well-drained soil. It is advisable to use a stem cutting that is two to three inches in length and have at least two pairs of leaves. Moreover, even those pieces that break off from your plant can be propagated. Make sure that the stem is still green inside and dry it out before trying to root it. Jade plants can grow up to five feet tall, so it’s better to transfer it to a pot that can accommodate the size you are achieving. Do this only when the soil is dry. Place the pot in a warm place with indirect light. Do not water the cutting until you see signs of new growth—like roots finally settling and recovering—for about a week or so. The warmer months of spring and summer are the best times to propagating jade plants. Warm and humid, but a well-ventilated environment, is ideal in growing roots. If you want your jade plant to flower, hold back water and place it in cooler temperatures. Winter and early spring can also help your jade plant bloom tiny white flowers. If properly potted, succulents require minimal maintenance to survive indoors. Yet, it doesn’t mean you have to rely on its natural ability to absorb sunlight and water. Like every other living thing, plants need care and assistance as well. There’s no need to regularly prune your jade plant, except when you want to give it some upright shape or control its size. I usually do this to remove dying branches, but I do not prune more than one-third of the plant’s height. Don’t worry, the plant will naturally branch out at the spot where you trimmed them. Jade plants do best in daytime temperatures of 18 to 24 degrees Celsius and nighttime temperatures of 10 to 13 degrees Celsius. During winter, temperatures normally drop, which could kill your jade plant. If you can, bring your plant indoors and water it once or twice a month. ​If your place doesn’t hold a lot of humidity, your jade plant may dry out quickly. You might have to water every five to seven days. If you live in a more humid place, you may only need to water once every other week, or less. If you think having more humidity is suitable for your jade plant, I suggest misting the leaves in the morning so they can still dry out before the cool evening. I use a balanced water-soluble fertilizer. It’s recommendable to feed your jade plant with an organic fertilizer sparingly or about once every six months. Add fertilizer only when the soil is damp because dry soil can damage the plant. Meanwhile, overfertilizing can make lead to salts building up in the soil—which can also burn a jade plant. Remember that succulents need their roots to dry quickly. Regular potting soil usually suffices, but it stays wet too long. If you’re using a well-draining succulent soil, you can water a little bit more than if you’re using a normal potting soil. You may also opt for a fast-draining mixture or modify a normal potting mix with an inorganic agent like perlite and pumice to increase drainage. I have discovered that a mixture of sandy loam, organic matter, and peat moss provide a good growing environment. Large pots retain more water. I recommend using a clay pot that has a good and effective drainage hole. To prevent root rot, do not place the bottom of the pot directly in the water. ​Lastly, plants need to be trimmed. You may put waterproof wood glue on open cuts to prevent infections. In a nutshell, the best way to safely care for your jade plant is knowing the basics of watering. When watering, ensure that the soil is completely soaked and then dry it out completely. Water your jade plant once or twice a month, but monitor the soil's dampness before doing it. Do not water your jade plant when the soil is still wet or damp. You’re going to experiment a little and see what watering schedule works for you. Use a good draining soil and pot. Your jade plant needs sun exposure at least four hours a day. Reminder: the hotter it is, the faster your soil will dry out, so you’ll need to water more. You see, both novice and expert gardeners can care for a jade plant. Share this post with your jade plant loving friends!